Two Australian food restaurant brands, chicken restaurant Red Rooster and salad bar restaurant SumoSalad, have announced a partnership that will see SumoSalads served in over 350 Red Rooster restaurants nationally. The two brands said the partnership was “an innovative Australian first” for the Quick Service Restaurant (QSR) industry. Two custom designed SumoSalads have been introduced to the Red Rooster menu at all stores nationally. The Companies said the Zesty Pumpkin Couscous Salad and Red Pesto Penne Salad had been specifically created to match the flavours of Red Rooster’s roast chicken. Both salads will be available as part of the a la carte menu as well as a part of a selection of value combos. On Sundays at Red Rooster, customers will be given a free regular SumoSalad of their choice with any Whole Roast Chicken purchase. Offer will be available at all stores for a limited time. 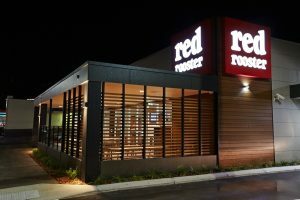 Red Rooster said the partnership was the latest move in its “Real Food journey”. The Company said last year it “removed all artificial colours, flavours and added MSG” from its kitchen-made menu. This was the first step in the redevelopment of its entire menu, which Red Rooster said will see the menu become “healthier and more natural”. Red Rooster is Australia’s largest roast chicken restaurant chain. The first Red Rooster store opened in Kelmscott, Western Australia in 1972, and Red Rooster now operates over 350 restaurants across Australia and employs over 7,500 people. In addition to roast chicken and chips, Red Rooster also offers rolls, salads and wraps, and a range of catering packages. “This partnership shows how serious we are about our real food credentials at Red Rooster,” said Anna Jones, National Marketing Manager for Red Rooster. “Our famous Roast Chicken paired with these fresh, high quality salads is the perfect answer for Australians who want tasty and nutritious food made easy. We are extremely excited about our partnership with SumoSalad,” she said. SumoSalad is Australia’s first and largest “healthy fast food retailer” and a market leader, with over 100 stores across the globe. The first SumoSalad store opened in 2003 on Liverpool Street in Sydney’s CBD and was an instant hit. SumoSalad CEO Luke Baylis said the Company was “always looking to expand its influence and help Australians eat healthier food with purpose”. “This works well with Red Rooster’s mission to provide their customers with a variety of delicious, wholesome menu items. We hope this is the first of many healthier options to come,” Mr Baylis said. SumoSalad’s Resident Dietitian Georgina Moore said it was pleasing to see the range expand through new channels. “This partnership will see millions of Australians have easy access to freshly prepared meals made easy,” Ms Moore said. “It’s fantastic that Red Rooster are not just introducing new menu items, but redeveloping their menu to make it healthier and more natural,” she said. Farmers Union Iced Coffee will be rebranding, but only for a limited-time.